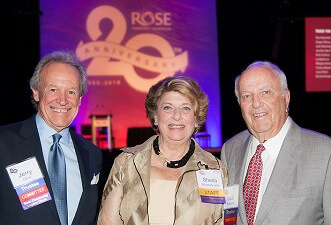 On June 18 at the Seawell Ballroom in downtown Denver, Rose Community Foundation celebrated 20 years of serving the Greater Denver community. Joined by friends, donors and grantees, Foundation leaders looked back on the work the Foundation has done in Denver. Those gathered to celebrate heard from Colorado Governor John Hickenlooper, who spoke at length about Rose Community Foundation’s leadership on issues like Denver’s Road Home while he served as mayor of Denver. Rose Community Foundation president and CEO Sheila Bugdanowitz spoke about the story of Rose Community Foundation, its leadership role in the Jewish community, and in its other grantmaking focus areas. Board of Trustees Jerry Glick spoke about the Foundation’s current impact in the community, and Jennifer Atler Fischer, immediate past Chair of the Board, announced the winners of Innovate for Good. Thanks to Rose Community Foundation, many nonprofits are ensuring their own sustainability and stability through endowments. 36 nonprofit organizations have endowment funds at Rose Community Foundation. Those endowment funds are valued at $39.7 million, and have distributed more than $25 million to support the mission and work of these organizations. 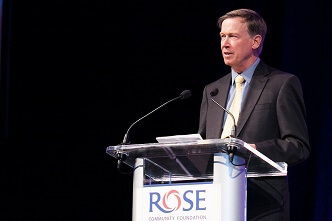 Colorado Governor John Hickenlooper commends Rose Community Foundation’s leadership and service. We’ve included some quotes from the evening along with photos of the celebration and the Foundation’s work over 20 years in the Greater Denver community.